Use a strop for the best edge. If you're looking for the sharpest edge possible we recommend our Leather Bench Strops. We have found nothing puts that final edge on a knife better than a leather strop. This strop measures 8" x 3" in size, an inch wider than our 8" x 2" Leather Bench Strop. The extra width can come in handy for sharpening any edge, but is particularly useful for stropping plane blades wider than 2". Our Leather Bench Strops are made of leather bonded to a solid hardwood base. The leather accepts honing compounds of various grades. We recommend our Green Honing Compound. The leather strop isn’t new to sharpening but it is still confusing to some. Like a razor strop, the bench strop is used to put a very fine edge on your blade. Barbers have been using leather razor strops for decades to keep an extremely sharp edge on their straight razors. The razor strop is an essential tool for any barber or anyone needing to keep a straight razor sharp enough to shave with. While a razor strop can be used to sharpen a traditional knife, it just isn’t the right tool for the job. For putting the final edge on tools and knives, we recommend our Leather Bench Strop. After sharpening your knife on a bench stone, we recommend finishing it off with a bench strop for an extremely sharp edge. Just think of this strop as your finest stone. 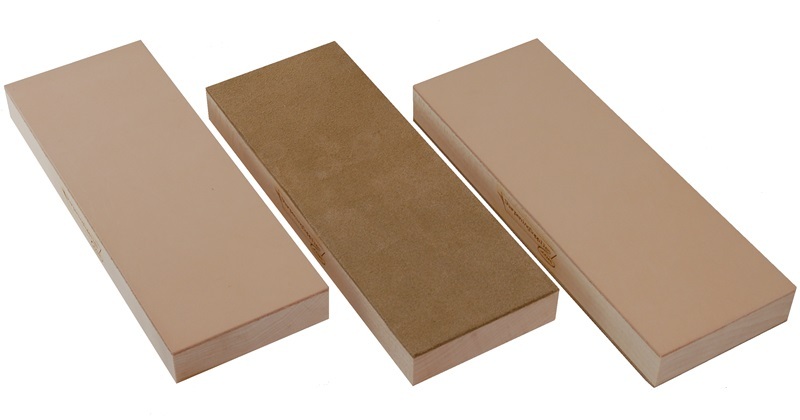 Strops can be made with smooth leather (grain side) or rough leather (flesh side). When deciding which one to carry we had to consider not only our own preferences but also the preferences of others for woodworking tools, carving tools, and knife sharpening. We even put them to a performance test and in the end, either one worked great. Instead of just carrying one type, we decided to carry both. Smooth - The smooth leather option is a very firm piece of leather. This leather is selected specifically for the smooth side only. If the leather is too hard, it just doesn't doesn't work well and doesn't accept compound well. If the leather is too soft, it doesn't produce as fine of an edge and won't hold up. This leather is more durable than the soft. Suede - The suede side uses the opposite side of the leather (it is technically called the flesh side). The leather we use is selected for its flesh side properties. This leather is different leather than our smooth side leather. In our research, the leather that makes a good suede side is different than the leather that makes a good smooth side. Our suede leather is a little softer than the smooth leather. The rougher and softer leather accepts compound very readily. Smooth and Suede Double Sided - If you think both options sound appealing, then get the benefits of both smooth and suede leather on the same strop! Q. 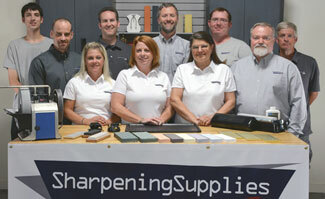 Does the leather cover the entire surface of the strop? A. Yes, the leather comes all the way to the edge. This allows you to use it like you would any other stones. Q. Can I use this strop without a 8" stone holder? A. Yes, it most certainly can be used without a stone holder or base. However, it was designed to be used with an 8" base and therefore doesn't have any extra area that can be used for clamping it to your work surface.